Impedance measurements based on voltage pulse injection and current detection are faster and easier to implement than measurements based on sine waves, but transients produced in the current-to-voltage conversion may lead to large deviations in the measurement result. Because those transients depend on the same impedance being measured, solutions based on specific circuit values fail for large measurement ranges. We propose to reduce those transients by controlling the rise time of the pulse being applied to the impedance under test. For a particular implementation of the method, transient amplitude has been reduced to less than 1 % of the full scale voltage, as compared to 40 % overshoot when faster voltage pulses were applied. Impedance measurements based on voltage pulse injection and current detection are faster and easier to implement than measurements based on sine waves, but transients produced in the current-to-voltage conversion may lead to large deviations in the measurement result. Because those transients depend on the same impedance being measured, solutions based on specific circuit values fail for large measurement ranges. We propose to reduce those transients by controlling the rise time of the pulse being applied to the impedance under test. For a particular implementation of the method, transient amplitude has been reduced to less than 1 % of the full scale voltage, as compared to 40 % overshoot when faster voltage pulses were applied. 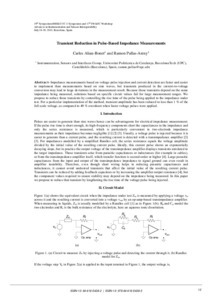 Aliau-Bonet, C.; Pallas, R. Transient Reduction in pulse-based impedance measurements,. A: IMEKO World Congress. "Proceedings 19th IMEKO TC-4, Barcelona, Spain Universitat Politècnica de Catalunya July 18th and 19th, 2013". Barcelona: 2013, p. 12-17.